When you want a cold glass of red or white to end the day, you want it to be exactly to your specifications. Some people are fine with room temperature, but if you like your beverage chilled, you’re usually stuck waiting for it to cool down in the freezer for about 20 minutes. Of course, this is the future, and if you have the money just about anything is possible anymore. If you want your wine cold, but also want to make sure to keep its flavor integrity, then the Ravi Instant Wine Chiller might be able to lend a hand. 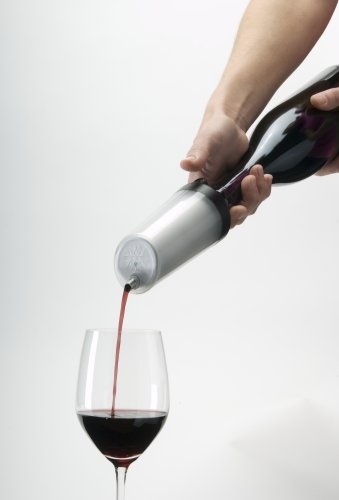 Rather than chilling the entire bottle, this is inserted into the bottle neck, and all you need to do is pour your drink. The inside of this device is a stainless steel tube that you’re meant to freeze so as the wine passes through, its temperature will drop. The important part is making sure you remember to put it in the freezer in between uses. Since not all wines are the same, you’ll want to mess with the valve control, which will change the rate at which the libations flow. This means you can have it range between chilled and straight up cold if you prefer. You will need to hand-wash this item, though hopefully you’ll remember to take that step before putting it back in the freezer after you’ve had your fill for the evening. This is a $28.90 purchase, and will hopefully be of some use to the lushes of the world.